Anglers love fishing on Hamlin Lake - located just four miles north of Ludington in West Michigan. 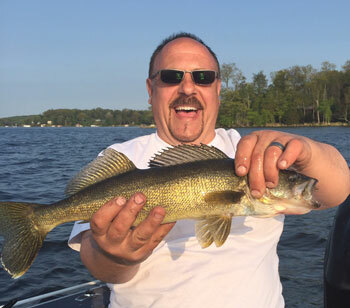 Throughout the year, Hamlin Lake and its bayous offer an outstanding variety of fish including tiger muskie, northern pike, walleye, large and small mouth bass, perch, crappie and bluegill. Lake Michigan salmon and steelhead are seasonally plentiful at the dam site within the Ludington State Park. Boat and motor rentals, launch ramps, bait, supplies, food and gas are never too far away. The lower lake is completely open water. The upper lake still had ice which should be gone by the end of the week. There was about 100 feet of open water around the edge. The ice along the shore has deteriorated significantly, thus limiting access. All the access points have open water. Ice fishing could be done. Anglers were getting panfish a half mile east of Wilson Hill Park however the action was hit-or-miss depending on the day. The better bite was in the evening. A number of crappie were caught in the crappie hole off Lincoln Road. The fish were suspended 10 feet off the bottom in 35 to 40 feet and hitting teardrop jigs with plastics, spikes or minnows. A couple walleye were caught in the evening off Duneview Drive. For the most part, fishing was slow. The only consistent bite was small perch. The ice is NOT safe for vehicles. Fishing improved as anglers were getting 10-15 panfish along the east side which included bluegill, crappie, sunfish and the occasional perch. Most of the perch were small. Crappie anglers fishing between Indian Pete’s Bayou and the Narrows were taking five to 10 fish per trip in 30 to 37 feet. A couple decent catches of bluegill and sunfish were taken from the North Bayou. Those fishing the walleye grounds off Duneview Road managed to get a couple legal size fish though many were too small. Pike anglers did well along the upper lake with tip-ups or when spearing though some were too small. Anglers were using Wilson Hill Park to access the lake, though anglers are still being advised to use caution as there may be thin spots. Catch rates slowed, with most getting 10 fish or less. Though the numbers were down, the size of the fish has been decent, with a few big crappie mixed in with the bluegills. The perch were small at 3-5 inches. Those targeting pike had limited success, and many of those caught were undersize. A few walleye were caught. Near the South Bayou, anglers were struggling to find keeper-size bluegill. There was six inches of ice out of Wilson Hill Park but anglers should avoid walking west out of the launch as there was open water there as of Sunday. Those targeting panfish out of Wilson Hill Park did well. Limits or near limits of bluegill, and some nice size crappie, were caught. Anglers reported an abundance of under size yellow perch in the area. Small jigs tipped with a wax worm worked best. Those targeting pike had to sort through undersized fish to find anything legal to keep. Was not completely froze; as there was open water on the northern sections of both the upper and lower lake. The bayous were mostly frozen however there was still some open water because of the moving water. Extreme caution needs to be used. Expect more ice to be blown open with the windy conditions.